Mist takes the morning path to wreath the willows—Rejoice, rejoice—small birds sing as the early rising monk takes to his sandals—Christ is born of the Virgin Mary—cloistered, the Benedictine dawn threads timelessly the needles eye—rejoice. In December 1972, a different edit (without the Cathedral-like acoustics) was issued as a single with the B-side The Holly and the Ivy. 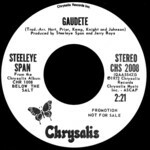 It was re-released in November 1973 to reach chart #14 as Steeleye's first outstanding chart success. The track was also used in 1977 for the B-side of the single The Boar's Head Carol. The song has appeared on many compilations over the years but with the exception of the Original Masters 2 CD set, the single version seems to have become lost in favour of the album version. 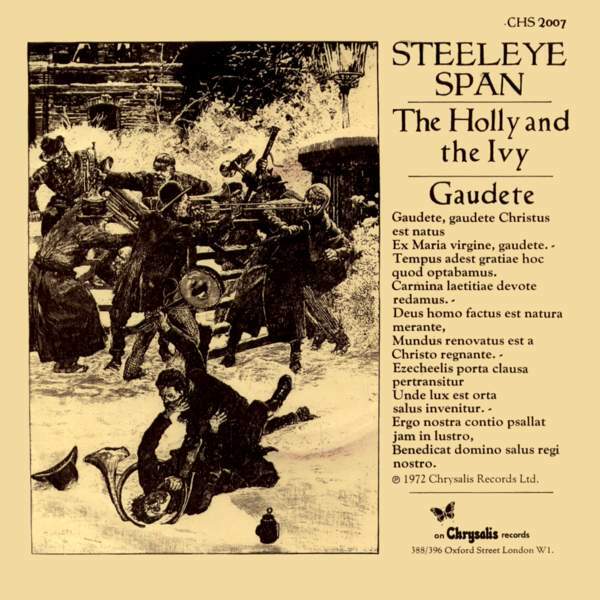 An original tape copy was found recently in the Festival Records tape vaults and has been fully sound restored for the reissue on the CD A Rare Collection 1972-1996 .
and from 1994 on the CD Steeleye Span in Concert . A new recording of Gaudete was released as a CD single in 2001 by Keltic Fusion (i.e. Troy Donockley, Nick Holland, Rose Kemp, Jacqui McShee, and Maddy Prior). I don't like this version very much; electronic drum 'n' bass doesn't really fit with this lovely song. 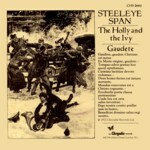 Steeleye Span recorded Gaudete again for the CD Present to accompany their December 2002 reunion tour. Compare to this Ougenweide's version of Gaudete on their album Sol . Of the Virgin Mary, rejoice! No music is given for the verses in Piæ Cantiones. They derive from the medieval Bohemian song Ezechielis Porta, which Finnish clerical students would have encountered in Prague and which shared a tune with a Czech vernacular Christmas song that still survives. Finno, the editor of Piæ Cantiones, was probably responsible for the refrain. It adapts the words of one of the medieval verses to the music which, in various forms, was sung throughout Lutheran Germany to Luther's single-stanza grace before meals, Danket dem Herrn. Verse 3 refers to the eastern gate of the city in Ezekiel's vision (Ezekiel 44:2). The gate is a traditional symbol of Mary as perpetual virgin. Thanks to Joe Offer for correcting the errors in the verses on the record sleeve and for supplying me with translation and notes.